In brief: Titouan Puyo, Olivia Piana and Amandine Chazot have claimed victories at the “Summer Cup” in La Baule, France, with a strong lineup of the nation’s finest paddlers headlining the 6th annual edition of this beach festival. Saturday’s course race was a tight affair, with Titou snatching the win by just four seconds from an in-form Eric Terrien, while Martin Letourneur was right on their tail all the way to the line. The podium was repeated in Sunday’s distance race: After more than an hour of racing, Titou crossed the line to defeat a resurgent Eric by less than half a minute, with Martin a further minute behind in third. Florent Dode and Joseph Gueguen also showed fine form in rounding out the top five. 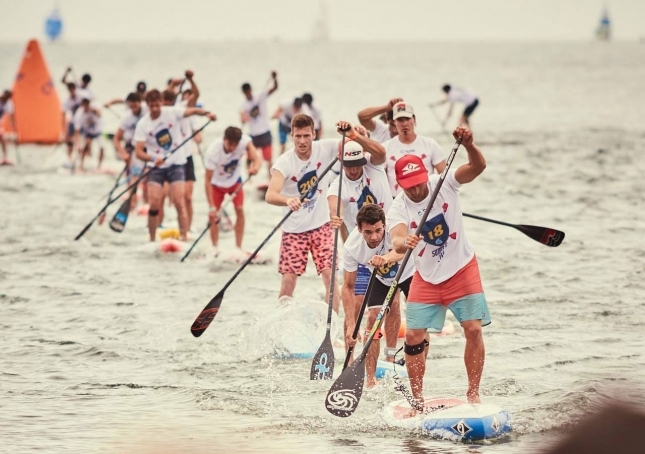 After his annus horribilis in 2015, Eric, the former king of European paddling, has been showing great form over the past few months. But while he was leading early in the course race and fought hard in the distance event, the BIC team rider couldn’t match the raw talent of Titouan, who claimed yet another win to further cement his place as Europe’s #1. After Olivia Piana powered home to win Saturday’s course race by almost a minute, one of France’s rising stars, Amandine Chazot, took out the women’s distance race in a time of 1 hour 25 minutes (Olivia sat out Sunday’s race). The Summer Cup also featured a whole bunch of fun races (plus appearances by no less than 3x winners of Miss France), with the event geared more towards first timers rather than the pros — apparently they had 2,000 people take part in the SUP demos, which is pretty cool to see. Here are the top finishers — click here for the full results, and head on over to the official Facebook page for more photos.